Now that you’ve had a baby, you’re probably wondering how to set up the baby’s room. It is not a cheap affair as you will require specialized and costly furniture. Some of these are chairs and with the best one, you can even save yourself from a 2 a.m. cry fest. All in all, do you know what chair type you should choose? Some of the most popular chairs are gliders and rockers. They are custom designed to give you comfort while sitting on them and the baby is relaxing. Even though the two serve the same purposes, they differ in several perspectives even though most people interchange them. Before you decide what to buy between a glider and a rocker, it is only fair that you understand their differences. Read through to the end and get an insightful view of the variances. A glider chair is a type of rocking chair designed to move as a swing seat. The entire frame of the glider consists of a seat firmly attached to the base using a double-rocker four-bar linkage. Also, it has non-parallel suspension arms that cause the glider chair to simulate a rocking-chair motion or movement when it swings back and forth. A glider chair is used as an alternative to a porch swing. It is also popular as nursery furnishing as it helps parents while feeding newborn babies. A glider is marginally safe for toddlers and pets as the pinch points are moved away from the floor. A glider is also called a platform rocker. 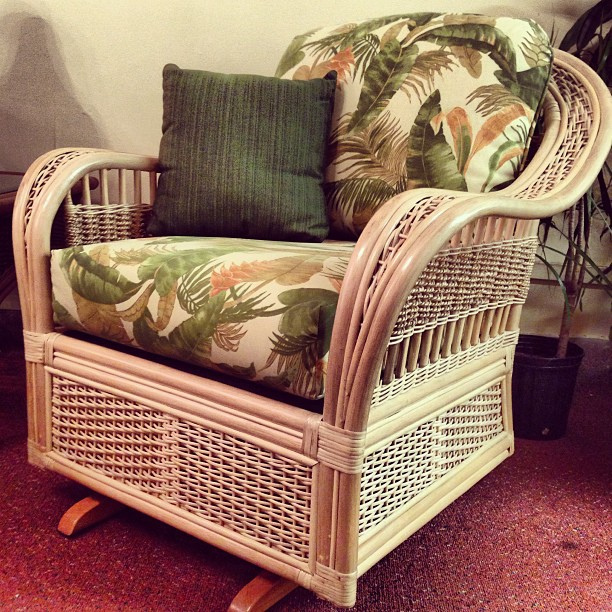 A rocker or rocking chair is a two-curved bands type of chair. The bands are attached to the bottom of the rockers legs and connect the legs to each other on each side. The rockers or bands are made in a way that they touch the floor at only two points. This ensures the user can enjoy the ability to rock back and forth by pushing lightly with their feet or shifting their weight. 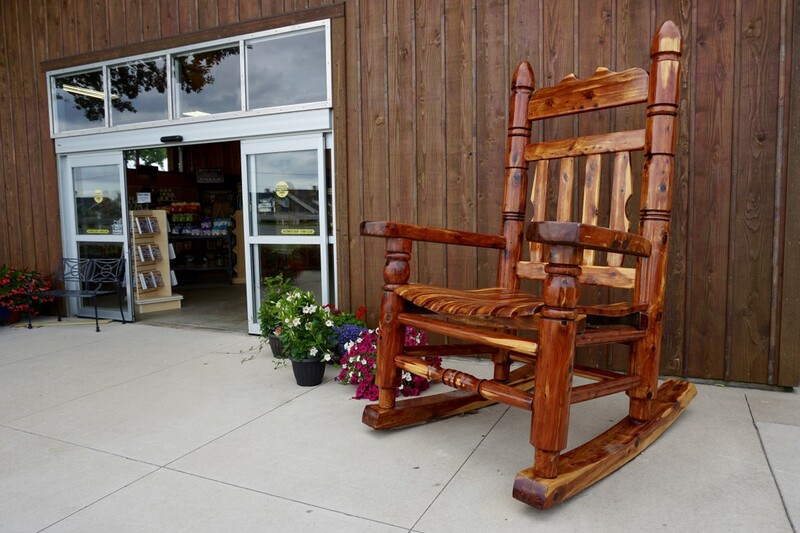 Some rocking chairs are made to fold. Most of the chairs are commonly made of wood. A rocker chair has varied purposes. The main one is its use as a therapeutic tool as its gentle motion offers a soothing feeling. The rocking motion is believed to offer a faster onset of sleep. The main difference between a glider and a rocker is the way they move. For the rocker, the movement follows an arc pattern while a glider’s movement is usually back and forth. Some gliders swivel too. A rocker is designed with rockers touching the ground at two points for each movement. This is not friendly for pets and toddlers as the pinch points can squeeze them. A glider, on the other hand, has pinch points away from the floor. This ensures the toddler using it is safe from being trapped. The sizes between a glider and rocker differ too. A glider is on the heavier side as the materials used are not lightweight. A rocker, on the other side, is made from lightweight materials which makes it lighter to transport and move around. A glider chair is normally cushioned with most of them consisting of matching ottomans for the user to relax their feet. A rocker on its side does not come fitted with ottomans which makes it uncomfortable when the user is rocking it with their feet up. However, a rocker can have cushion pads placed strategically on them but will within a few minutes get uncomfortable. A good rocker takes less space as compared to a modern glider which is built to occupy a larger area. Rockers and gliders have been a nursing necessity since time immemorial. The reason is that parents and the babies find the back and forth movements soothing. The motions are also known to induce sleep. The two types of chairs provide comfort and an even stylish place to feed, cuddle, and read to your child even though they differ in some aspects. Sarah Brown. 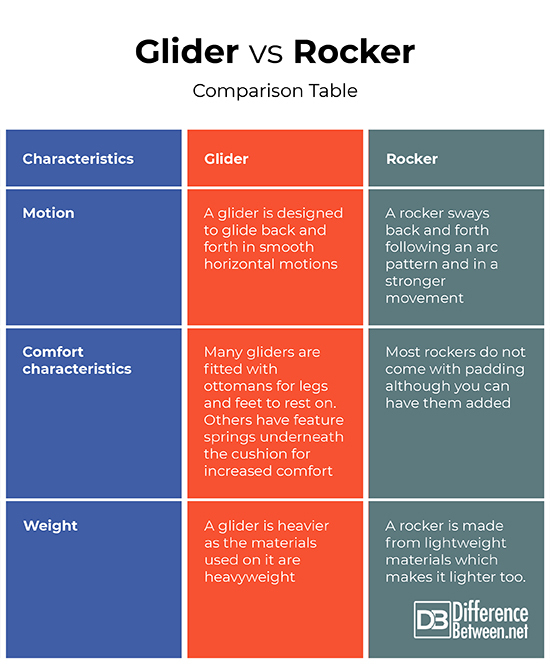 "Difference Between Glider and Rocker." DifferenceBetween.net. November 26, 2018 < http://www.differencebetween.net/miscellaneous/difference-between-glider-and-rocker/ >. Answers, Home. "The Difference Between Gliders And Rockers | Hunker". Hunker.Com, 2018, https://www.hunker.com/12370922/the-difference-between-gliders-and-rockers. Accessed 9 Nov 2018. "Glider Vs. Rocking Chair - Nursery Gliderz". Nursery Gliderz, 2018, http://nurserygliderz.com/glider-vs-rocking-chair/. Accessed 9 Nov 2018. "How To Buy A Glider Or Rocking Chair". Thebump.Com, 2018, https://www.thebump.com/a/how-to-buy-glider-rocking-chair. Accessed 9 Nov 2018.